San Francisco (April 8, 2003) – Power to the people. Living up to the web’s democratic roots, sites that spur dialogue and action on everything from the war in Iraq and grassroots organizing to newsgathering and online auctions are among the nominees competing for The 7th Annual Webby Awards, The International Academy of Digital Arts & Sciences® announced today. 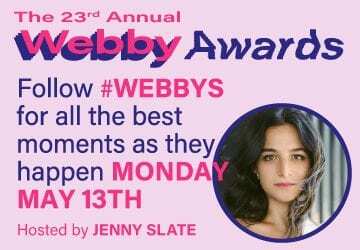 nominees is available at http://www.webbyawards.com/main/webby_awards/nominees.html. Hailed as “the online Oscars” by Time (May 13, 2002), The Webby Awards is the leading international honors for web sites. The awards are presented by the Academy, a global organization that includes over 480 members such as musicians Beck and David Bowie, Internet co-creator Vint Cerf, political columnist Arianna Huffington, “Smart Mobs” author Howard Rheingold, “Simpsons” creator Matt Groening, Real Networks CEO Rob Glaser, The Body Shop president Anita Roddick, and Oracle chairman Larry Ellison. cast their ballots at http://www.webbyawards.com/peoplesvoice/. Movable Type http://www.movabletype.org and Live Journal http://www.livejournal.com, which have contributed to the explosion in personal web logs, and MeetUp.com http://www.meetup.com and MoveOn.org http://www.moveon.org, two sites that have been used in innovative ways to organize people worldwide. “This year’s nominees are a tribute to the web’s power to facilitate worldwide conversation on ideas that are often overlooked in traditional media,” said Tiffany Shlain, founder and creative director of The Webby Awards. (Germany); and David Still www.davidstill.org (The Netherlands). and BBC Religion and Ethics www.bbc.co.uk/religion (Spirituality). Google also received two nominations for Google www.google.com (Technical Achievement) and Google News news.google.com (News). Additional sites receiving two nominations include: CBC Radio 3 www.cbcradio3.ca (Broadband and Radio); Disney’s Toontown Online www.toontown.com (Games and Youth); NASA www.nasa.gov (Education and Government & Law); the New York Times www.nytimes.com (Education and Travel); The Onion www.theonion.com (Humor and Print & Zines); oddtodd.com www.oddtodd.com (Humor and Living); Sodaplay www.sodaplay.com (Education and Youth); and Metacritic www.metacritic.com (Film and Music). will once again be held to a five-words-or-less acceptance speech. http://www.webbyawards.com/webby_biz/index.html for submission guidelines and entry fees. Founded in 1996, The Webby Awards is the leading international honors for consumer Web sites and individual achievement in technology and creativity. The International Academy of Digital Arts and Sciences selects the nominees, winners, and presents the awards event. Sponsors of The 7th Annual Webby Awards include media partners Business 2.0, Fortune and Fortune Small Business magazines; Event partners PricewaterhouseCoopers and Nielsen//NetRatings; Official Sponsors The Creative Group, IDG, Absolut Vodka, Comstock Images, and Rackspace Managed Hosting. For more information visit http://www.webbyawards.com/. The International Academy of Digital Arts and Sciences is dedicated to the creative, technical, and professional progress of the Internet and evolving forms of interactive media. The Academy’s goal is to assemble a brilliant panel of leading new media experts, visionaries, journalists, and luminaries to propel the Internet and Interactive Technology into the future. The Academy is an intellectually diverse organization that includes over 480 members such as musicians Beck and David Bowie, Internet inventor Vint Cerf, political columnist Arianna Huffington, Real Networks CEO Rob Glaser, “The Simpsons”creator Matt Groening, “Smart Mobs” author Howard Rheingold, Oracle chairman Larry Ellison, and The Body Shop president Anita Roddick. Members also include web developers, internet experts and technology writers and editors from publications such as The New York Times, Wired, Forbes, Spin, Fast Company, Travel + Leisure, the Los Angeles Times, Dwell and wallpaper. For more information, visit http://www.iadas.net.